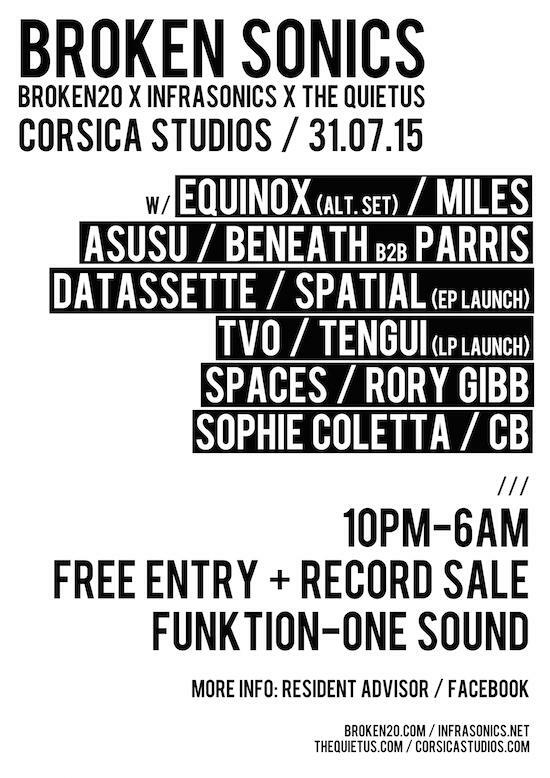 You might remember news a few weeks ago of tQ’s involvement in a party at Corsica Studios this Friday. Taking over room two, we will be presenting sets from Miles Whittaker of Demdike Stare as well as tQ’s very own Rory Gibb and Sophie Coletta. We also announced that Beneath would be playing a b2b set in the room with a special guest to be announced. That guest can now be announced as the Tempa, Keysound and Rinse FM-affiliated Parris. In room one on the night, Broken20 and Infrasonics will host proceedings with sets from Equinox, Livity Sound member Asusu, Datassette, Spatial (who will be launching his EP Infra12006 with a live set), Broken20 label head TVO (with a live audiovisual set), Tengui (whose debut album Transference is out today and will be presented live accompanied by custom visuals from Broken Mannequin), Spaces and CB. Spatial has just shared a brilliant mix made for Solid Steel which you can check out below. It features music from J. Tijn, A Made Up Sound, Beneath, Pev & Kowton and many more. Check a nice little live snippet from Tengui below Spatial’s mix too. As for the night itself, it all goes down at Corsica Studios on Friday (July 31) from 10pm - 6am with a Funktion One system and also a little record sale going on at the club too. What’s more, entry is free so make sure you head along. You can get more details here.